At about 1,500 metres above sea level, Cameron Highlands – located only four hours away from Kuala Lumpur – is set along a mountain plateau high above the river valley. Temperatures on this hillside fluctuate between 22° and 25° Celsius during the day and between 15° and 22° Celsius at night, making it easier than in the lowlands to jungle trek, camp and picnic. Named after William Cameron – a British government surveyor who ‘discovered’ the area in 1885 whilst on a mapping expedition – Cameron Highlands’ fame grew during the colonial occupation era as the British were attracted to this cool hill station due to its climate. As a direct result of their stay here, nostalgic reconstructions of English cottages and narrow village lanes are sprinkled across its landscape. These days the Highlands are home to a plethora of agricultural farms and there’s no place better in Malaysia to get fresher-than-fresh produce. 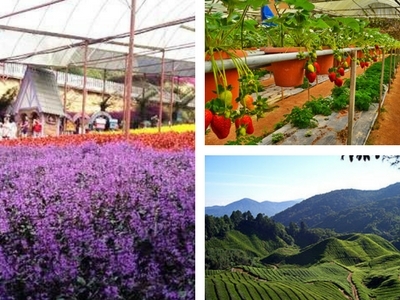 These farms and plantations make good sightseeing spots when you’re here – to best enjoy Cameron Highlands’ offerings, visit a sweet-smelling strawberry plantation, a sprawling tea estate or a prickly cactus farm.